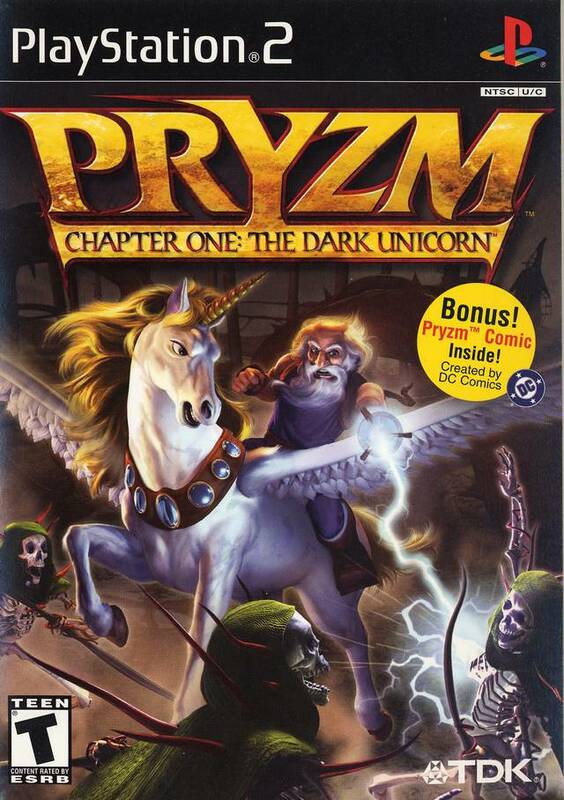 Perhaps thinking that a game’s playability increases per word in the title, Pryzm Chapter One: The Dark Unicorn is an action and adventure game with fantasy elements. A dark plague has spread across the land, corrupting all in its wake. The four regions of the world: the elves, gnomes, trolls and even nymphs have all been touched by the plague. The only land that has escaped is the land of the unicorns. Some time later, and for no real reason, Pryzm is sent out to get rid of the plague. Going with her is a grumpy old troll called Karrock. Using her magic, and limited jumping, Pryzm must carry Karrock while they try to free magic flowers in each of the regions to restore the balance and rid the world of the plague. After freeing one area, Pryzm begins to get visions of a dark unicorn. This dark unicorn begins to speak to Pryzm and reveals that he was once a great wizard among the unicorns but sought to bring nobility to the other races, by giving them all horns. Tapping into dark magic to bring amount his idiotic goal, he became sealed area in a area of wild magic. Only after freeing all the areas, can Pryzm and Karrock confront the ancient dark unicorn and finally rid the world of the plague. The game comes with a “bonus” comic book in case the game… becomes boring? I don’t know. If the hard difficultly does not annoying you first then the looping comments by the enemies and allies alike will. The limited jumping, which I hinted at earlier, is very annoying where regardless of the height Pryzm cannot jump onto it unless it is a ramp. The only way to free the plants of their poison is to first defeat their helper-enemies – the enemies attached to the flower by a magic beam – and then attack them unmercifully. That’s right. As a unicorn, you must beat up a flower. One of the high points of the game is the tutorial, as in it it allows you free play and unlimited magic. Magic becomes very limited once levels begin. Just stay away from it. No, don’t think about playing it. It’s annoying, contains little plot and you can plan to die over and over again as you try to complete just one level. If you do get your hands on a copy use this cheat code: Left, Right, Left, Right, Up, Down, Up, Down on the D-Pad at the beginning of every level to complete that level and thus view all the cut scenes. 4/Red.